Having grown up on a steady diet of fairytales and Disney films, it won't surprise you to learn that I have a rather large soft spot for happily ever afters and modern spins on classic fairytales. 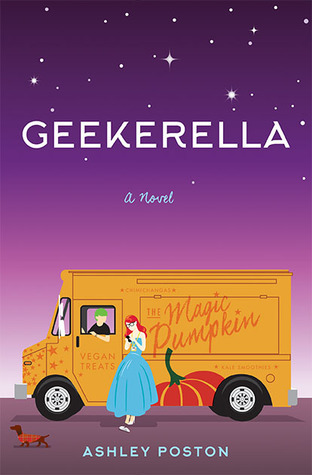 Geekerella is a brilliant take on the classic Cinderella story, weaving in fandom, conventions like Comic Con and references to make it something special all on its own. It is, without a doubt, one of my all-time favorite takes on Cinderella that I've ever experienced! Geekerella is told from two different character perspectives, Elle Wittimer and Darien Freeman. Elle is a diehard fan of the TV show Starfield, which is getting remade into a movie with a brand-new cast. She wants to enter the cosplay contest sponsored by the producers, both because she is a fan and because the first prize would help her gain her freedom from her stepfamily much sooner. Darien, on the other hand, is also a Starfield fan, and it's a dream come true for him when he's cast as Federation Prince Carmindor in the remake. But he'll have to fight to prove that he's more than just a pretty face to the Starfield diehards who've dismissed him. Their paths cross, and sparks fly - but it remains to be seen what sort of happy ending is in store for these two. I loved Geekerella. It's the perfect modern take on Cinderella, and feels like the novel I've been waiting for that I never knew I wanted until I was reading it already. Poston does a lovely job of incorporating familiar details from Cinderella (and even a few things that felt very much like A Cinderella Story, another favorite Cinderella interpretation of mine). But while the story mirrors the fairytale, it also stands on its own quite well. I loved Elle, I loved Darien and I adored their relationship (even though as a long-time rom-com fan, I could totally see where it was going). But most of all, I loved the way Poston wrote about fandom. As someone who wholeheartedly throws herself into the fandoms of the things she loves, it was refreshing to see someone who gets it and knows how to describe the experience, the feeling, the everything about it. Like I said, I loved Geekerella. If you haven't yet decided whether to read this one, if it hasn't even been on your radar, if you like a good love story, if you love a young adult contemporary, if you want a Cinderella retelling, if you want something incredible to read, well, definitely get your hands on this book right away. You won't regret it!